At the beginning, I wasn't sure how you would deal with the multiple layers. I knew that the player would collect gaming devices (Game Box Entertainment Systems) and that this would add more layers to play in, but I didn't know if you would see them all at once - or had to cycle through them. Worse yet, I wasn't sure if I wanted to make a puzzle game or a purer platformer. On that decision rested much about the level design of the game. If I made a puzzle game, you would need to be able to 'solve' the puzzles and levels would be more tightly made, probably with only one right solution. As a platformer, I could be more free to explore weird ideas. I went with the platformer aspect, and decided that you would see all layers at the same time in a grid of Game Boxes. By looking at their shrinking size, I decided that 25 would be a good number - 36 levels would make them too small. And I went on creating 25 levels that introduce a few new mechanics here and there. Even tho I had ideas about power-ups and complex gameplay systems, I decided to make Layer Lady only playable with the directional arrows. It's not possible to keep every version of Laya alive at the same time, but as long as you keep the last one safe, you can continue the game. My initial idea was to have you lose whenever one of the Layer Ladies died, but that was too harsh. The game is quite difficult, after a while you collect 'Danger' signs that create hazards in previous safer layers, and getting to the 25th one is a real challenge. 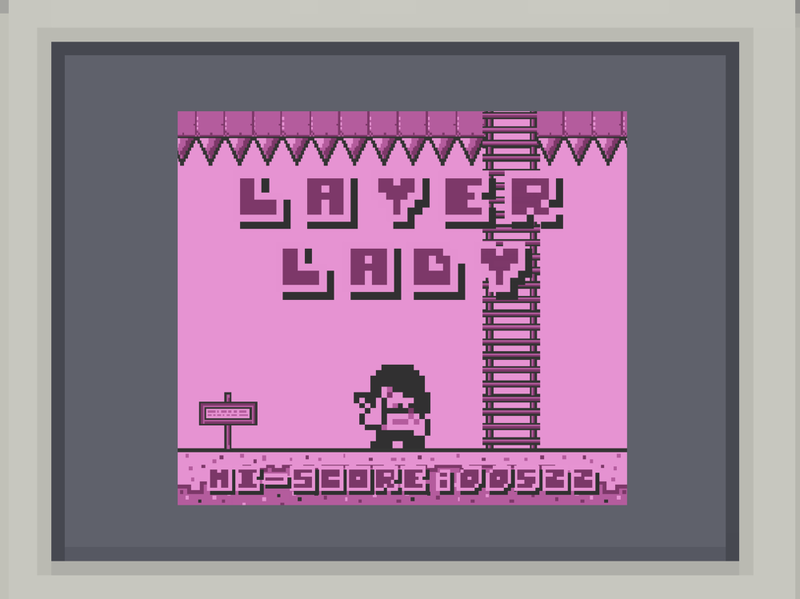 I think not all levels are 100% super perfect, and there is some wonkiness with the physics at times, but for a 17 hours project, I think that Layer Lady is a great template on which another greater game could be built, and I think it's quite fun too!